Nick Cartell as Jean Valjean in the new national tour of Les Miserables. The last time Philadelphia audiences saw playwrights Alain Boublil and Claude-Michel Schönberg’s Tony Award-winning musical “Les Misérables” on a local stage, we lived in calmer socio-political times. Now, five years later, things are a little bit rockier. What do you miss most about Philly's recent past? “And ‘Les Mis’ is right on time, more relevant than ever,” said Nick Cartell, who plays “Jean Valjean” in the roadshow of “Les Misérables,” currently running at the Academy of Music until Jan. 21. “For me, in today’s world, where everyone is fighting against injustice and looking for forgiveness and for a better life, the show offers resonant themes," said Cartell, the famed Broadway tenor. Based on French poet and novelist Victor Hugo’s book of the same name, the grand musical play about 19th-century France was an epic, yet intimate look at the haves and have-nots set against the backdrop of a violent revolutionary period. “With Valjean, you start the show in such a beat down, dark place – a man imprisoned for 19 years for stealing bread, always looking over his shoulder, trying to do good,” stated Cartell. Reconfiguring “Les Misérables” and its roadshow for present-day audiences finds its director, James Powell, and his production crew and cast looking toward Hugo as a visual artist rather than wordsmith. Their version of “Les Mis” reimagines its moving scenery according to the period paintings of Hugo, giving the new production life and light. 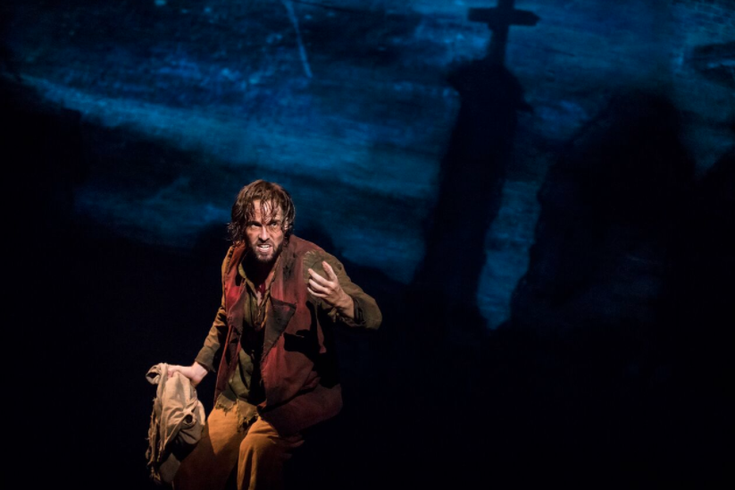 “If you have witnessed the show in the recent past, we have done away with the turntable and tried to use as much of Hugo’s imagery as possible for projections in this 'Les Mis,'” said the musical stage veteran. "Those same paintings set the audience in a true space, set and time," stated Cartell. Powell – currently in Japan directing a musical version of “Mary Poppins” – agreed that this shift in color and tone allow their musical to open up and brighten. “Our designer, Matt Kinley, found Hugo’s portfolio and used that as a template and a base from which to work,” said Powell. Having known “Les Mis”’ legendary producer, Cameron Mackintosh, for more than 20 years, Powell stated that working for the musical’s originators meant having tough taskmasters he could never second guess. “Cameron can be both hard to please and difficult to fathom, but it is awesome to be challenged like that and he really keeps you on your toes,” said Powell. Like the actor Cartell, director Powell saw and adored the original “Les Mis” when it opened in London. Along with being determined to introduce spontaneity into a new “Les Mis,” Powell wanted to make it more immediate and relevant. A.D. Amorosi hosts a radio show at WPPM 106.5 FM Mondays at 4 p.m. called “Theater in the Round” that covers theater, drag, cabaret, burlesque, performance art and opera.